I meant to do this yesterday, but already had a post scheduled. 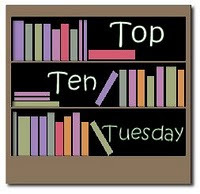 For those who don't know, Top Ten Tuesday is hosted by The Broke and the Bookish. Without further ado, here are the top ten reasons why I love book blogging. Let's be honest here, I am not an expert on the publishing industry. At all. However, if you stick around Twitter long enough and follow hashtags such as #yalitchat or #kidlitchat you start to pick up on things. Before I joined GoodReads on started networking, I didn't know what an ARC is. Now I have an understanding of why they exist, and how processes such as querying work. There's still a lot that I don't know, but I feel better informed. To be honest, I'm not sure how I kept up with book releases before GoodReads. I think I'd just stumble across them as I perused the shelves of my local indies. Between posts such as Waiting on Wednesday and those that focus on new releases, I usually have a pretty good idea of what's coming out in any given month. I've also stumbled across various cool bookish items in my journeying through the interwebs, such as awesome t-shirts from Out of Print clothing. I've always loved writing. I wrote short stories as a kid, lots of poetry in middle school and high school (mostly bad), papers in college and now reviews. I'm going to grad school in the fall, where I will probably be using my writing skills quite a bit. It's nice to have a venue where I can continue exercising them, even if it is a slightly different tone than anything else I've written. At some point in the day, even if it isn't until late at night, I wind up taking a glance at my Twitter feed. Or an e-mail from GoodReads. Or some other social networking site. When I log into these places, I sometimes see Tweets or reviews from authors. The fact that I can reply to 140 character thought from an author or watch them in a video does boggle my mind just a tiny bit. One minute I'm hustling out of a bookstore with that person's shiny new book in hand, the next they are on my computer screen, vlogging or replying to me. I never really knew that this was possible as a child, probably because online social networking was far less expansive than it is today. Maybe I'm a dork, but when authors e-mail me, comment on a review or tweet me I periodically fangirl just a bit. I won't get into how much I fangirl once I meet them in person, but you get the point: talking to living, breathing authors is pretty cool. How many times have I mentioned Twitter already in this post? I don't know, because I'm too lazy to count. In addition to networking, I also have fun with Twitter. I like that I can talk to others about reading, pick up on news and random facts or just share photos of my dog, Macey being adorable. Some people clearly put a lot of time and effort into their vlogs. They painstakingly edit, add fancy intros, etc. I just turn on my camera, talk and put it on YouTube (although I admit, sometimes it takes a few takes for me to get what I want to say right). I like vlogging because I get a lot of comments from people who enjoy it, but also because I love watching vlogs. Seeing a brief video of someone talking books almost makes me feel as though I'm meeting them in person. Hopefully I give you guys a similar impression when I vlog. Plus, then you sometimes get to see Macey! I have discovered so many awesome new to me bookstores since I started my blog, and it all started because of hair. My mom and I drive about a half an hour to go to our hair salon of choice, so I have time to kill once I'm done there. I was aware that author Swati Avashti lives in my area, so one day I asked if she had any bookstore recommendations. I was not disappointed! Plus, I also discovered a new bookstore when Andrea Cremer disclosed the location of her Nightshade release party. This leads me to my next point. Upon discovering lots of awesome bookstores, I started getting their newsletters and checking their websites regularly to see what events are going on. I'm much more well-versed on what authors are in they area and when. I've had the chance to meet with awesome book bloggers on a few occasions. I've found that when you stick said bloggers and a couple of authors in a room together, hilarity and great conversation ensues. My family has known about my blog since the day I started it, even though I'd wanted to start one months before. They are all incredibly supportive and like to use it as a conversation piece. My mother has even started her own blog, The Random Animal. Go check it out. Meanwhile, Macey offers non-verbal support by sleeping next to me while I read and blog. That's right kids, I'm about to get sentimental. You already know that I put a decent amount of time into this blog and Twitter. A couple of Tweets or comments can lead to e-mails, long g-chats, fun things sent through the mail and occasionally, meet-ups in person. Sometimes these people are bloggers, sometimes they're authors. At any rate, the people I've met through blogging are the ones that make it worth it. Now I want to know what you guys love about blogging. Let me know in the comments! I love your list. I'm going to totally agree with blogging helping to maintain a writing habit. I got out of creative writing when I went away to school, but I also find it good that I can be creative in writing book reviews. I totally need to eventually start meeting these authors. It seems I'm one of the few bloggers who hasn't met a number of authors yet.